While living in Albuquerque, there were 2 things I could always count on during the holidays?..Tamales and Posole. So in order to continue enjoying one of MY favorite holiday recipes, I created this version of New Mexican Vegan Posole. 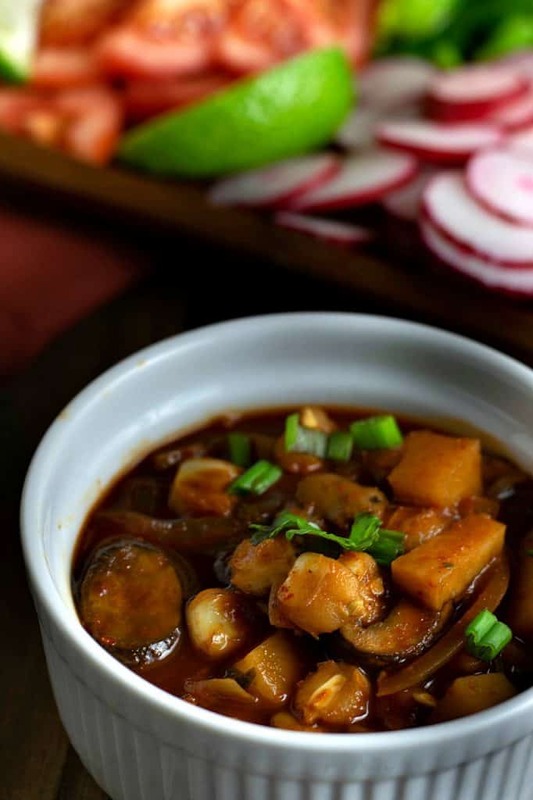 Since I am a huge fan of New Mexican Red Chiles, I made this vegan version of Posole Rojo. I can still remember visiting friends on Christmas Eve, and walking into their kitchen to the smells of freshly made Tamales and huge pots of Posole. If you?ve never been to Albuquerque or Santa Fe around Christmas ? it?s truly magical, and definitely something to add to your bucket list. Imagine a clear, crisp night, lit up by hundreds of little paper lanterns (farolitos) as you settle down to a nice, hot bowl of freshly made Posole. Good times, dear friends, and wonderful memories. This recipe requires 3 main ingredients, all of which should be easy to find at your nearest grocery store or on Amazon. Usually located in the Mexican Food Aisle. You could also use California Chile Pods or even Guajillo Chile Pods. This is where I find the little bags of Mexican Oregano too.